What makes a polar bear a polar bear? There are certainly many obvious answers –for example, we know they have white fur, eat a diet rich in fat, and live in one of the coldest climates on earth, the Arctic. However, at a deeper level we can look for the genetic signatures that underlie these traits and ask questions about how they evolved. Another important question would be the speed at which these distinctive traits evolved. There has been substantial controversy over the age of the polar bear lineage – fossil evidence points to a young age of 800 to 150 thousand years ago, while genetic data estimates dates anywhere from 5-4 million years ago to 600 thousand years ago. How old is the polar bear lineage, or when did they diverge from their closest relative, the brown bear? What happened after the polar bear and brown bear diverged – were there any changes in population size, or did the two species continue to interbreed on occasion after the split? Are there any genes under selection in the polar bear lineage that might give us a hint as to how polar bears evolved? To answer these questions, the authors not only sequenced a very high quality single polar bear genome, but also sequenced an additional 79 individuals from different regions and 10 brown bear genomes – a huge amount of data for a non-model organism (examples of which include mice or fruit flies). They used two different methods to estimate the divergence times (Question 1) and population history (Question 2) of the polar bear. One is a new method that compares how lengths of DNA sequences are shared among and within populations. The second method compares distributions of the genetic data to models of population history (different times, sizes, etc). Both methods agree that populations diverged only 479-343 thousand years ago, a date that matches the fossil record. These analyses also revealed evidence of a past bottleneck, meaning that they went through a period of time where they had a much smaller population size. Furthermore, there were indications of interbreeding between polar bears and brown bears, mostly polar bears joining brown bear populations, and likely not recently. Given that polar bears are a fairly young lineage in evolutionary time, their physical and behavioral adaptations to their extreme environment must have evolved extremely rapidly. 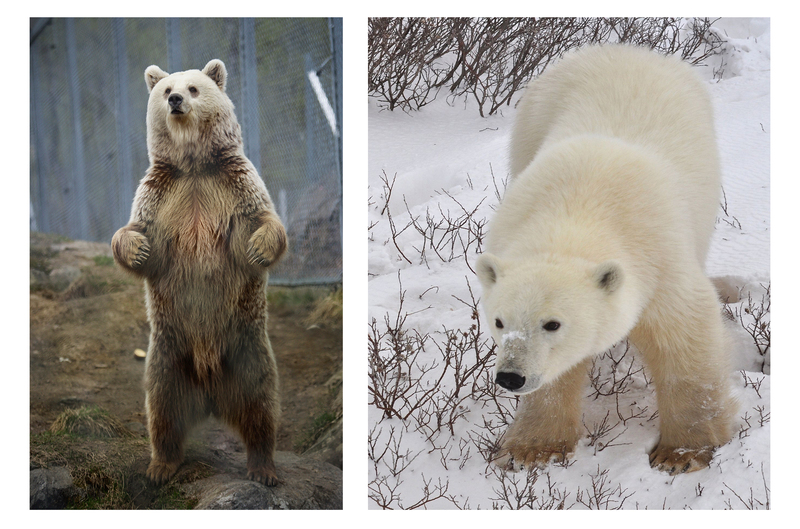 The top genes with signatures of selection in the polar bear lineage mainly were involved in sarcomere organization (muscles), blood coagulation, heart development, and adipose tissue (fat) development. In particular, the extremely high level of fat in the bears’ diet—their body weight can be 50% due to fat, depending on the time of year!—causes extremely high levels of cholesterol, a concern shared by many humans. The polar bears actually have nine fixed (i.e. everyone in population shares them) mutations that change an amino acid in the protein encoded by the gene APOB, a gene that has been linked to elevated of cholesterol in humans. These change likely help the bears to clear cholesterol from their blood, allowing them to cope with their fat-rich diet. Of the top 16 genes with the strongest signatures of selection, nine of these (including APOB) are related to heart function in humans, many related to weakening of the heart (“cardiomyopathy”). The authors of this paper speculate that the cardiovascular system may have needed to reorganize either because of plaques in arteries caused by the high cholesterol levels, or because of the long distances they have to swim. Finally, the authors identify two genes that are strong candidates for one of the most iconic polar bear traits – their white fur. These two genes, LYST and AIM1, are important in melanosome production. Melanosomes produce melanin, the pigment that makes mammalian hair brown. So, by disrupting melanosome production, a bear that was previously brown would be turned white. This paper is an example of what can be learned by sequencing the genomes of many individuals of a non-model species. Not only do we know much more about what makes a polar bear and how evolution works, but some of these genes and mutations may be able to help treat diseases in humans. As genome sequencing becomes less expensive, enabling many individuals of a species to be sequenced, who knows what we might discover! Allison Shultz is a PhD candidate in the Organismic & Evolutionary Biology department at Harvard University. Next ›Xyleborinus saxesenii, welcome to the eusociality club!